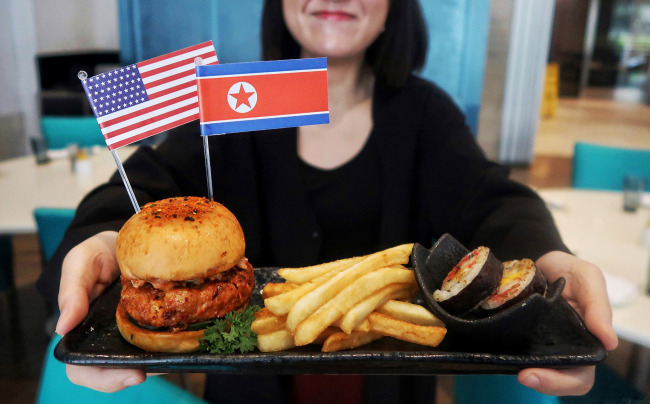 While Singaporean food and beverage businesses cashed in on the historical US-NK summit by releasing products from the Trump-Kim burger to “Rocket Man” taco, South Korean F&B companies were more cautious about joining the celebratory mood. “It is surely a historical moment that we all wanted to see, but I think it is still early to launch related products celebrating the historical moment of the two leaders,” an industry insider told The Korea Herald. “Not only is the summit taking place outside South Korea, but to be honest, I’m still puzzled about suddenly improved public affinity toward Trump and Kim,” he added. A Gallup Korea poll conducted on some 1,200 South Korean adults from May 29 to 31 showed that 32 percent of South Koreans approve of Trump, while Kim gained a 31 percent approval rating. Compared to two months ago, Trump’s approval rating went up by 8 percentage points, while Kim saw a 21 percentage point increase. “South Koreans‘ attitude toward Kim is changing based on the progress of inter-Korean ties as well as the result of US-NK talks,” said Gallup Korea analysis. “But still, a large number of South Koreans are maintaining a healthy skepticism toward North Korea. It will take time for the public here to build trust toward the North,” it added. This week, South Korean food and beverage giant SPC Group provided over 4,000 sets of bread and beverages at NK-US summit press center in Singapore. Such complimentary snacks were not for sale commercially, the company said, but rather a show of support for the press and related officials’ hard work on the Trump-Kim summit. “We have not discussed about launching a public promotional event or a campaign to celebrate the NK-US meeting. It is quiet careful for us since things are moving so quickly,” said a SPC official. Meanwhile, some companies tried to celebrate the reconciliatory mood of the two leaders in a different way. A leading brewery company Oriental Brewery on Tuesday released a promotional video clip which contains a message of reconciliation and cooperation, based on the long-waited step toward world peace by the two leaders. “In the 20 second-long video, we wanted to portray that uncomfortable relationships could improve based on the conversation and cooperation just like Trump and Kim did,” said an OB official. “June is a historic month for South Koreans since there are many milestones such as NK-US summit, local elections as well as 2018 FIFA World Cup,” said a Papa John’s Korea official. Some industry insiders said if they had known that things would fold out this quickly, they could have prepared to launch Trump-Kim commemorative goods. “The fashion industry could have at least produced a Trump-Kim t-shirt to celebrate their big step toward peace on the peninsula. But it is true that the industry was not prepared since things happened so quickly,” said an industry insider.